The evening begins with St Kilda Mailboat, a male/female duo who don odd hats and put you in mind of the Singing Kettle for adults. Their humorous songs win over the crowd and get them laughing, there is even sweets thrown out, prizes and a lot of dancing. 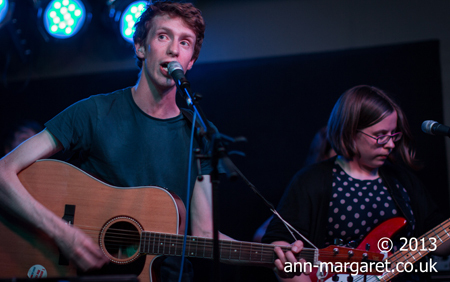 Tonight Kid Canaveral is just singer/guitarist David McGregor, which adds an acoustic intimacy to the usual indie pop. ‘Low Winter Sun’ reminds us that we are coming up to winter but McGregor keeps us laughing and in good humour with his dry, self deprecating wit. A version of ‘Ally’s Army’ is seen as a suitable homage to the Scotland team who are, once again, getting beaten down the road at Hampden. Towards the end he invites Randolph’s Leap and a couple of other guests on stage for ‘You Only Went Out To Get Drunk Last Night’. Shortly after coming on stage Randolph’s Leap‘s Adam Ross announces that there has been too much laughter tonight. The laughs don’t stop there though as Ross’ witty observational songs often have the audience laughing. The Glad Cafe is quite a small venue for such a big band but tonight that seems to work well. The band really seem to be enjoying getting the chance to play new songs live and older songs such as ‘News’ and ‘I Can’t Dance To This Music Anymore’ are greeted warmly by the crowd who dance and cheer throughout. They leave the stage but are soon coaxed back for an encore of ‘Crisps’. This is a great night full of fun, playfulness and laughter; the party atmosphere of an album launch is embraced and enjoyed by bands and audience alike.